This month, TDmonthly Magazine’s Dolls Roundtable participants reviewed the P31 Elizabeth “Pure Heart” doll by One2Believe. Elizabeth is part of an exclusive new line of quality dolls featuring 19.5”-tall characters that each come with an accessory item and activities designed to help teach girls of today to become the Proverbs 31 women of tomorrow. 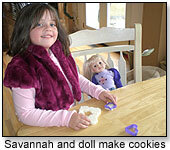 Most reviewers appreciated the “cute” appearance and playability of the dolls, while the girls enjoyed making cookies and focusing on helping others. Roundtable participants included Ruth Mandt with her granddaughters Paige (6) and Brielle (10); grandmother Barbara Smith; Amanda Forrest with her daughters Sydney (7) and Savannah (6); Kim Hobbs, owner of Hobbs House of Dolls in Marietta, Ga.; and doll collector Brenda Oxford. “Pure Heart Doll” comes with cookie cutters and a recipe, and 6-year-old Paige McQuirt reported that she liked making the cookies. 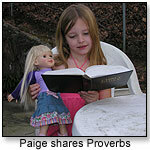 “Paige and Brielle loved the doll, and doing things to help others made them feel good about themselves,” grandmother Ruth Mandt said, adding that she appreciates that the doll takes the focus off clothes and boys, and encourages girls “to think of others.” She gave it the highest rating: 5 stars. Sydney let her 6-year-old sister have the doll because she “really fell in love with it.” Savannah enjoyed putting it to sleep in a doll crib, and appreciated its go-to-sleep eyes. 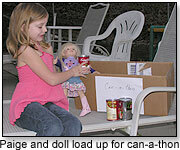 Grandmother Barbara Smith said she thinks the doll is cute, but believes the construction could be a little better. Nevertheless, she rated it high, with 4 stars. And though collector Brenda Oxford said the doll is not a collector-type, she noted that she would buy it as a gift, and gave it 4 stars. “I do not see the religious tie-in of the cookie cutter and recipe,” retailer Kim Hobbs pointed out, but mentioned the doll might sell well in Christian bookstores. She gave the doll a “3” rating. Hobbs thought the doll has a cute face, but noted that its clothes could fit better. •Watch Pomona and Toy Fair TOY VIDEOS by Category! •My Best Sellers: G. Willikers, N.H.
· Preschoolers: Is it Noise? Or Music?